Even before he went out to bat, Maxwell already had an idea that it was to be his night. His haul of 3 for 10 to help stall England after they made a rapid start in Hobart had given the Australians a smaller chase than they may have initially anticipated. 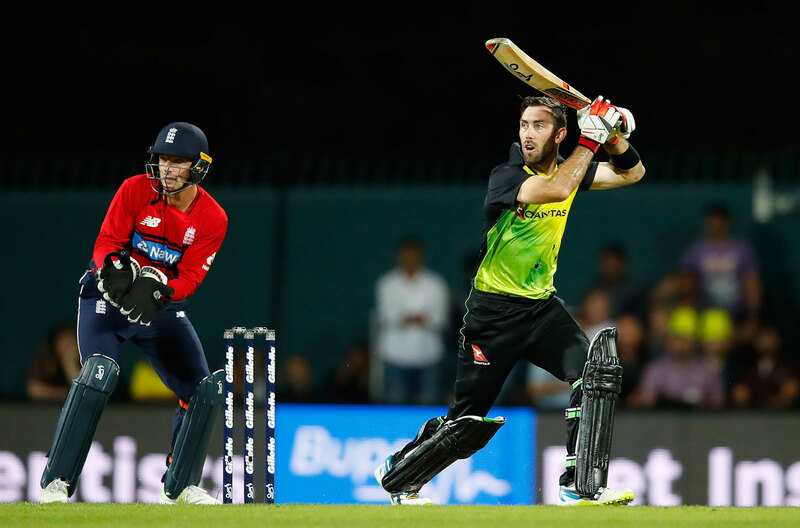 But when David Willey swung his way past David Warner and Chris Lynn in the very first over of the pursuit, Maxwell found himself needing to play - for T20Is, anyway - the long innings. He spent a few balls getting himself in, strolling to a sedate 11 from 13 balls before ransacking 29 from his next ten: taking 15 from five balls of Chris Jordan's second over, and depositing Adil Rashid for sixes over midwicket and cover. His innings, one of the most watchable centuries of the year, put Australia well on course for victory. Of course it would not have been Maxwell without some helping of the eventful. On 40, he flicked Tom Curran to deep square leg, where Alex Hales shelled the chance. On 59, a miscue off Rashid was misjudged by Jason Roy, running in from long-off, and after lengthy television replay consultation, the attempt to catch was ruled not to have carried, in defence of the on-field soft signal being out. If Roy and England were surprised by this, they were to be left crestfallen by how Maxwell took advantage. The latter stages of the innings were less about whether Australia would win than how Maxwell might manage to make it to a century. When Alex Carey bunted a single from the first ball of the penultimate over, Maxwell stood on 97 with the scores level. After a cover drive at Mark Wood hit the field, Maxwell decided on the aerial route, launching a towering six over the midwicket rope to reach a hundred as effective as it was entertaining. Few international batsmen can put on the afterburners like Maxwell, particularly if he is granted the luxury of a few balls to get himself in, as he was in Hobart. The dismantling of Jordan and Rashid in consecutive overs more or less put the result beyond doubt, while also setting Maxwell up to bid for three figures. 1 Number of other Australians who have made more than one T20I century: Aaron Finch and Maxwell. "The way I worked after the start - 2 for 4 in the first over while the ball was swinging around a bit - to get through that was probably something people had doubted in my ability. To get through those first three or four overs where the ball was zipping around... I was able to hit a couple in the middle, and once you do that you can on a bit of a roll." Karthik came to the crease with India requiring 34 from the last two overs. He took 22 off the penultimate over and held his nerve when India needed five off the last ball - hammering a six over cover to give them a famous win. Fakhar set the tone for Pakistan's highest successful T20I chase with a 46-ball innings that gave his side their ninth successive T20I series win.